Situated in the low-country marshlands of the Lockwood Folly River - just north of Shallotte, North Carolina, this Fred Couples signature course retains two main elements...challenge and precise shot planning. Carolina National is referred to as one of North Carolina's best golf courses. Golf Digest has rated this 27-hole course as one of the most renowned along the eastern seaboard. Since Carolina National continues to maintain a healthy wildlife refuge, they are recognized as an Audubon-Certified Sanctuary. No two experiences are alike at Carolina National. Spanning over 7,000 yards from the tips, golfers will quickly determine the game style needed for them to conquer this course. Three of the nines are named in honor native birds: The Heron, The Egret, and the Ibis. Golfers favor The Heron because of its impressive track of luscious greens and the view of the Lockwood Folly River. There is a green on this nine that is almost completely surrounded by the Lockwood Folly River. The strategically placed trees pose a threat and require golfers to strategically plan their tee shots. Despite the many great features of Carolina National, this course has flown under the radar for far too long. The course is an exceptional facility with favorable conditions, playability, fair challenges, and abundant scenery. Golf at Carolina National...an outstanding course packed with challenges and rewards. Daily golf deals and discount golf is available year round. Book your Myrtle Beach tee time now! Course was in great shape considering all the rain from the previous day. Greens were fast and rolling straight. Overall, a very good experience. Our only complaint was the shape of the cart path...rough shape in places...bumpy ride. Will definitely play again. Played at Caroline national about 1 month ago and was disappointed in the greens.Well I went back yesterday and too my surprise Greens were much improved. Give them another 2 weeks. Need a cut and roll and most will be fine! The course is really quite beautiful in terms of layout and I could see how it has the potential to be quite lovely, but on a recent trip to Myrtle Beach to play golf this month (May2018), two golf courses, The Legends and Carolina National, failed to inform us until we were ready to tee off that their greens had been largely destroyed over the winter. On most greens, we were putting on sand or dirt, or greens pocked with dead area. I don’t thing we saw a decent green on either course. I can’t believe the courses didn’t re-sod their greens for peak season and more importantly, I thought it was dishonest to charge out-of-state visitors peak season rates for courses in such poor condition. It was also dishonest letting us book these courses and not informing golfers us of the terrible green conditions until they we were ready to tee off. I travelled over 1300 miles from Nebraska to play here. I understand why courses are reluctant to tell golfers when the course is in bad shape because people might cancel, or go elsewhere. As it is though, such dishonesty from these two major course in the Myrtle Beach area will likely lead us to choose other golf destinations in the future. It may be a long time before we return to Myrtle Beach for golf. How can you defend your greens? Here are pictures I took from of one of them. Again, I had read some poor reviews previous to my visit so I called to see if the course had improved and was told the greens were in near perfect condition. Does this look like near perfect greens? Your reply to my previous post did not even address the fact that you or your employee lied to me and thus stole money from me and the other members of my foursome. I understand several courses in the area have had troubles with their greens. It happens. However, I called Sandpiper Bay, where I had a tee time, to check their green conditions. They were honest with me and told me they were still in sub par condition. I did cancel the round but I will definitely go back there time and time again because of their honesty. I spoke with one of your employees after our disappointing experience and was told this wasn't the first time he had heard the same complaint about customers being lied to regarding course conditions. Stop lying to customers just to get their money. It will catch up with you in the long run!!!! 1st visit Saturday March 17.. We enjoyed all three nines.. One of the few courses we played last week not twisted through a housing development.. Friendly helpful staff.. Look forward to returning sometime in season When your greens come back..
Carolina National Golf Club, located on the Winding River plantation, is home to three equally attractive out-and-back nine-hole loops: the Egret, Heron and Ibis. This is a big-dimension layout that roams its way over a wide area of modestly undulating, mainly wooded terrain. Plenty of small lakes, ponds and wetlands making their presence felt, while tall pines line several fairways, providing a screen behind which real estate often sits. There is much to applaud and enjoy in this challenging and scenic course. If we had to pick a favourite nine, it would be the slightly tighter Ibis, with its more natural feel and containing some of the best of the 27-holes. 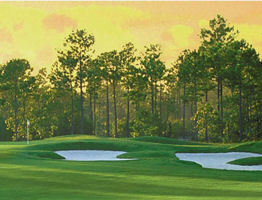 Carolina National is referred to as one of North Carolina's best golf courses.